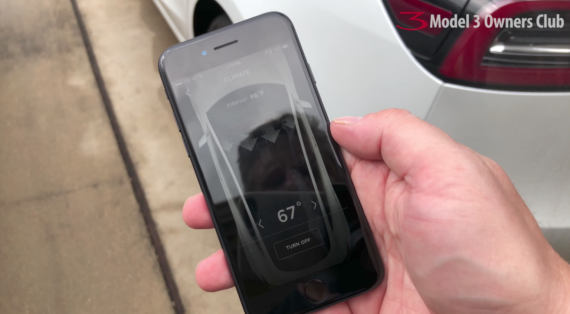 Following up on Steve and Kyle’s great coverage of Tesla Model 3 exterior details and Tesla Model 3 interior + infotainment details, here’s my piece covering the third segment of the Model 3 Owners Club’s deep dive into a Model 3 they came across. 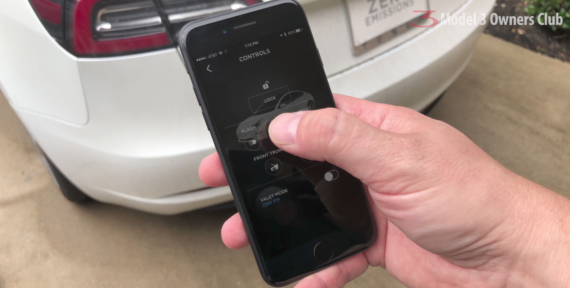 This article covers the windshield wipers, touchscreen glare (or lack thereof), control stalks, unlocking the car, the keycard, the phone app, and driving the car. The windshield wipers are … windshield wipers. I honestly don’t think much attention needs to be spent on such mundane things, but I guess I could imagine some people being concerned about how they work given their new design. Additionally, having the smart wipers in a Model S that just turn on when the rain starts dropping, I can see people’s desire to have that in a Model 3 (I want it!). At the moment, unfortunately, the wipers don’t sense the rain (so you have to keep your eyes open and press a button if it starts raining — #thetoughlife). 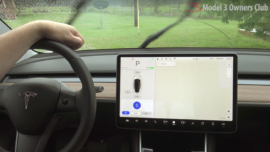 The rain-sensing wipers will reportedly come later with a software update, and the Model 3 Owners Club crew notes that even Tesla Model S and Model X vehicles with Autopilot hardware version 2 (not the Mobileye stuff we have on our 2015 Model S) don’t have the rain-sensing wipers. You have two windshield wiper speeds — Slow and Fast. Each of those can be steady or intermittent. You can navigate to the windshield wiper options from the touchscreen, or you can just click a button on a stalk on the left side of the steering wheel and they will automagically pop up on the touchscreen. 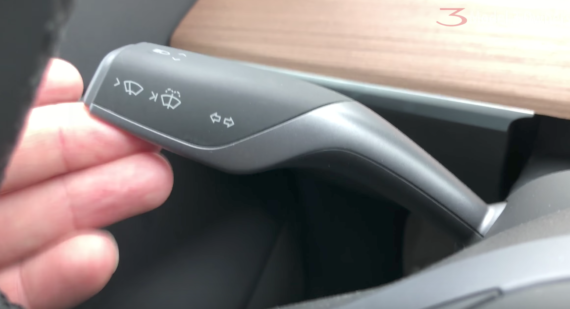 A common question/concern is whether the touchscreen on the Model 3 will be hard to see in bright daylight. I’ve never noticed a problem like this with the Model S, so figured it wouldn’t be a problem in the Model 3. Trevor and team confer after spending some time with the car. He also notes that the touchscreen is very firmly in place (of course! ), doesn’t rotate, doesn’t angle, etc. Just in case you had questions lingering on those matters. Windshield Wiper Activation and Fluid — as expected. Turn Signals — as expected. High Beams — press left stalk forward to turn on/off. Park/Reverse/Neutral/Drive — all on right stalk. Cruise Control/Autopilot — tap/double tap down on right stalk to activate. (On Model S, you pull a left stalk toward you twice, so this is a bit different. If you have the Tesla app on your phone, all you need to do to unlock the car is walk up to it with your phone in your pocket/bag/hand. 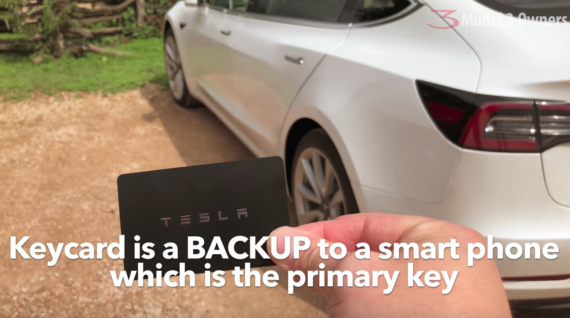 If you don’t have a linked phone with the Tesla app on hand for some reason, you can use the keycard Tesla gives you. It is the size of a credit card and you just need to place it next to a pillar between the front and back seats, and then place it in a certain spot between the front seats. Control climate settings in the car. Lock and unlock the car. Open and close charge port. No 12V outlet in trunk or frunk. No maintenance plan/schedule as of yet. The first thing Trevor highlights is that the view in front of the driver is very nicely clear as a result of nothing really being in front of him other than the steering wheel. Makes sense. He also noted that he could basically see the speed limit out of his peripheral vision, and certainly didn’t need to do the worm or contort himself uncomfortably to get a straight view of it. 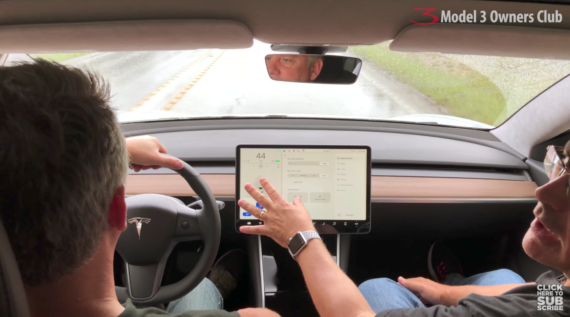 Ken adds that the screen is a nice distance from the driver, so there’s no need to really lean over to do anything on the touchscreen (there is a bit on the Model S and Model X touchscreen). 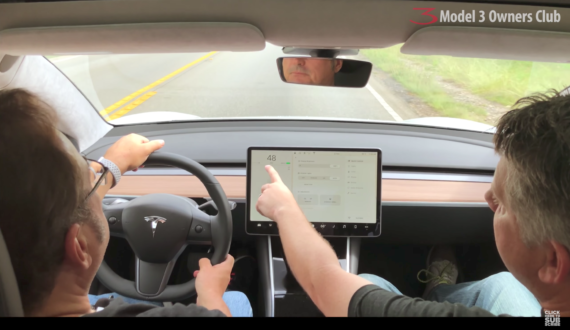 Autopilot features like Autosteer and Summon aren’t functioning yet, but Trevor notes that you do see the road lane markings and nearby cars/objects in the visualization on the touchscreen. 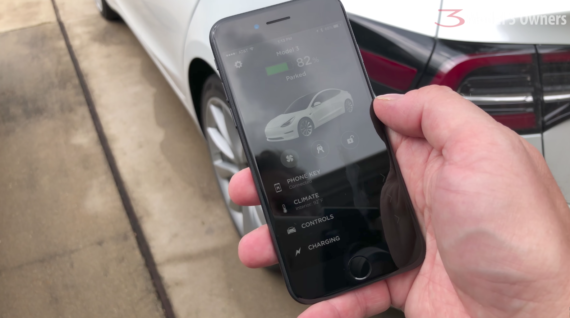 There has been some conjecture that the extra Autopilot functionality isn’t active yet simply because it’s in learning mode (i.e., Tesla is collecting data from cars on the road with Autopilot in a kind of shadow mode in order to get the technology to an acceptable level of road awareness before providing such features to customers. They also note that the glass roof blocks sunlight, heat, and UV rays adequately. It blocks UV rays 99.9%, according to Tesla. Ken is again inspired to highlight how “phenomenal” the visibility from the Model 3 is. The front passenger and driver have great view in basically all directions. Trevor and Ken especially appreciate the low dash and low-sloping hood. They seem impressed with the Tesla Model 3 turning radius, especially in relation to the Model S, and the smooth drive. 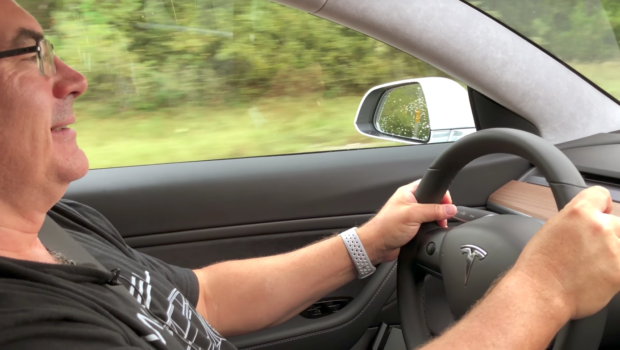 And Trevor says it feels like it has the same acceleration as a base Tesla Model S 85.